I spotted this bird on Friday as I explored the area around my hotel near the airport in Munich, Germany. I am not sure of the exact name of the town, but it is one of many airport hotels that are in a relatively rural area adjacent to the airport. I spotted the bird, which I was sure was some kind of a raptor, from a distance and was able to move a little closer to the mound on which it was perched. My initial thought was that it was some kind of hawk or falcon, but it was different from any of the ones that I have seen in my home area of Northern Virginia. 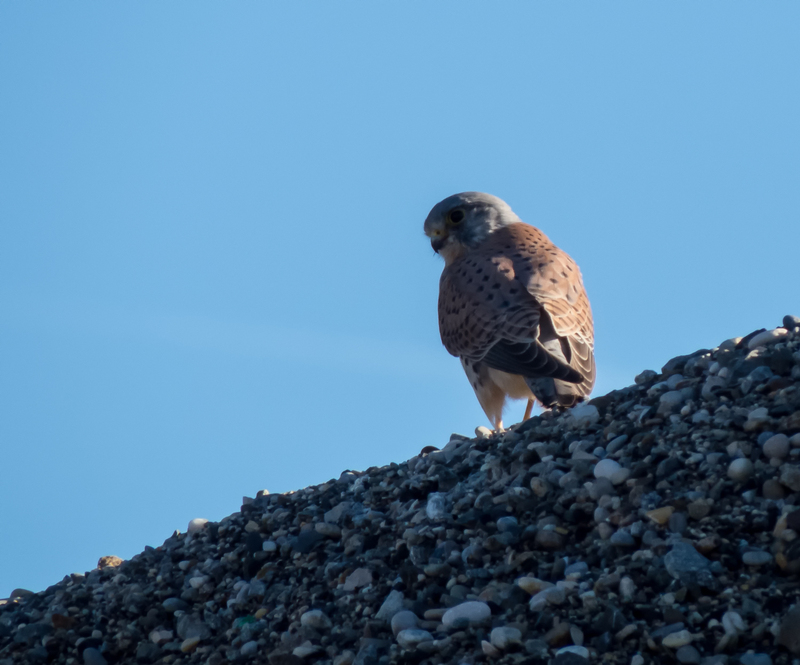 Thanks to the experts on a Facebook birding forum, I learned that this is a Eurasian Kestrel (Falco tinnunculus). It is somewhat similar to the American Kestrel, the smallest falcon that we have in North America, a species that I have seen a few times. I like the angle of this photo, Mike. Thanks, Dan. The bird was perched on a large mound and I was shooting upwards at it. He looks like he was cooperating.